Price includes: Price, based on seven travelling includis flights, B+B and evening meal and transport. Not included: Insurance, personal expenses, midday dining, drinks and any entrance fees. Single supplement of €200 applies. We will hope to visit Mount Paggeo, Nestos Delta, Porto Lagos and Lake Ismarida, Evros Delta. Dadia Forest and Lake Kerkini. As this period includes Orthodox Easter (Sun 1st May), accommodation will be selling out so any expression of interest should be made asap. Date for your diary. February 13th. A Massive thanks to the ringers and helpers to date. In 2015 we colour ringed just over 100 birds. We intend to commence a registered RAS project on April 1st 2016. We need to ensure we have a minimum of 30 breeding adults colour ringed to commence the project, so we still need to catch and ring! So looking for ringers and helpers on February 13th. DNFC Outing – Swan Ringing. The Dublin Naturalist Field Club are being shown how Mute Swans are ringed and processed. Meeting at 9am at the Goldenbridge Luas Stop (Marble Bar). I hope I can solicit your help with the following. Some of you may have seen this campaign online already and apologies for not getting in touch sooner but this Bill is being fast-tracked through the Dail and we are having to fast track too. Please sign the petition here: NO! to more slash and burn! Tell your local TD or Senator that you care about this issue and want the changes to the dates for hedge cutting and upland burning in Heritage Bill 2016 stopped. Please use your facebook pages and twitter accounts to repost BirdWatch posts and tweets. A coalition of Irish conservation and environmental NGOs (BirdWatch Ireland, An Taisce, Irish Wildlife Trust and the Hedgelaying Association of Ireland) have together launched a Campaign ‘No to More Slash and Burn’ to stop the passage Heritage Bill 2016 which includes changes to Section 40 of the Wildlife Act. The changes proposed are to allow hedgecutting in August at a time when birds are still nesting and to allow burning of habitats in the uplands into the month of March again at a time when sensitive upland species are beginning their nesting activities and starting egg laying. As of writing almost 14,794 people have responded to this campaign by signing the petition. This is an astonishing response and shows huge support for birds and biodiversity in Ireland. The Minister for Arts, Heritage and the Gaeltacht, Heather Humphreys T.D. announced these changes to the Wildlife Act the day before Christmas Eve. The Heritage Bill 2016 is being fast-tracked through the Oireachtas before it is dissolved in advance of the upcoming General Election. Despite significant advocacy work by the NGOs concerned and impassioned speeches by Senators John Whelan, David Norris and Gerard Craughwell, the Bill has passed the Senate and is on its way to Committee before it goes to the Dáil. We still have time to influence this decision. The current legislation (Section 40 of the Wildlife Act 1976 (2000)) permits the cutting of hedgerows and upland burning outside of the bird nesting season from September 1 to February 28th. The Minister for Arts, Heritage and the Gaeltacht, Heather Humphreys T.D. announced a review of Section 40 in December 2015. She received 188 submissions. Analysis by BirdWatch Ireland and the Hedgelaying Association of Ireland shows that the majority of submissions were against any changes to Section 40 and many called for any decision to be made on good science. The changes are being proposed as part of a two-year pilot scheme with the provision in the proposed legislation for this to be continued thereafter. The pilot scheme will managed by Ministerial regulations and have certain restrictions but no detail of any restrictions/conditions have been made public. No detailed rationale has been presented on the reasoning behind the changes or the science which underpins it. Indeed the Minister proposes to conduct research on impacts to birds and to collect Irish nesting data after she makes these changes instead of before the changes. 1. The proposed changes will negatively impact populations and nesting productivity of bird species which begin their nesting activities in our uplands in March (Curlew, Golden Plover, Skylark, Meadow Pipit) and for species which continue to nest into August in our hedgerows (especially red-listed Yellowhammer, Greenfinch, Linnet). 2. These changes will also impact on pollinating bees (bumblebees and solitary bees) a third of which are heading for extinction[All Ireland Pollinator Plan]. 3. There are provisions for hedgecutting for health and safety reasons on our roads under the existing legislation, that is why these proposals defy logic. 5. No scientific argument has been put forward in any of the submissions made to the Minister or in any statement made by the Department of Arts Heritage and the Gaeltacht to justify the change in dates. No rationale for the changes has been provided. 6. There has been very poor consultation with environmental NGOs on this issue. SIGN THE PETITION AND TELL YOUR REPRESENTATIVES THAT YOU CARE. 20th February 2016 The 2016 Wicklow County Bird Race will take place on Saturday 20th February. Meeting at the car park at the southern end of Bray promenade (by the amusements) at 07:00am for team registration. Start time is 07:15am sharp. The race will finish up at 18:45pm in The Beehive Inn (on the N11 south of Rathnew). Teams of 3-4 people per car at €5 per person. There are prizes for teams in each category with the highest number of species recorded. Bird racing is simply great craic and a good way to start off the new birding year. Furthermore, records from the day will be compiled and entered into BirdTrack. 1. Birds recorded in Co. Wicklow only. 2. Each species seen scores one point. 3. Each species heard only scores half a point (mark with 'H' on the score sheet). 4. A species must be seen by at least 3 team members to count as one point. 5. A species must be heard by at least 3 team members to count as half a point. 6. Feral Pigeon and the re-introduced population of Red Kite count but not escapes (Black Swan, Bar-headed Goose etc.) or feral/introduced species whose populations are not self-sustaining yet (Mandarin Duck etc.). 7. Teams finishing late will be docked points as appropriate! 8. Record birds on the score sheet & check-list provided. 9. The race is just a bit of fun and anyone taking it seriously will be eliminated! The Brent Goose research group have put GPS tracking devices on some birds as part of their ringing this time round in Dublin. While the devices themselves are not easy to see, this group of birds have their own set of rings which other birds won't have. Blue on the right (with a letter AND a number) Orange on the left. The group are particularly interested on the birds welfare and if the devices are causing any upset to them. To report your sightings please - E-mail the ring details, date/time, location to the project’s resightings co-ordinator grahammcelwaine@btinternet.com. BirdWatch Ireland, The Golden Eagle Trust and the Irish Raptor Study Group and have formed an exciting conservation partnership and collectively are co-ordinating the 2015 Irish Hen Harrier Survey on behalf of the National Parks & Wildlife Service of the Department of Arts, Heritage & the Gaeltacht. The Hen Harrier is protected by the EU Birds Directive and listed on Annex 1 and as such monitoring, research and protected areas are a vital component for the conservation of the species. Survey and monitoring data collected during national surveys are vitally important as these data are used by the government and other agencies to help inform management and conservation decisions. Several regional declines were recorded during the last survey in 2010 (http://www.npws.ie/sites/default/files/publications/pdf/IWM59.pdf) and it is important that we re-survey to establish the status of the species in Ireland, including within six Special Protected Areas which have been designated to maintain and enhance Hen Harrier populations. This survey will begin at the start of April and the project co-ordinators are running a series of training workshops to ensure all surveyors are familiar with the methods involved and to offer opportunities for new fieldworkers to participate to help monitor the Hen Harrier population. Similar to previous years the survey will examine all suitable hen harrier habitats during the breeding season (April to August) and look for evidence of Hen Harriers breeding or using these areas. It will be important for observers to record any hen harrier behaviour as well as their preferred habitats and any threats or pressures in the nearby areas. To effectively survey all areas where Hen Harriers occur during the breeding season is a significant undertaking. The survey relies on the support of a substantial volunteer network, and in the past BirdWatch Ireland branches have played a vital role and therefore we hope you will consider volunteering to support this conservation task and to cover a 10km square (or two) or perhaps put together your own small team and cover a number of squares. Standardised methods will be available at the workshops and by email. Many thanks in advance for your help and enjoy the watching the harriers (hopefully!). "Just thought I’d give you a shout about the Dublin City Swift survey which is running again this year. The format is more systematic this time. With only a month to go, we are trying to mobilize people to get involved. There was quite a bit of interest from the Tolka branch last year so I was hoping maybe a few people could be encouraged to help fill in some of the many gaps in coverage, especially on the north side. As far as I can see, only one square has been taken on in the Tolka area. Just right click on a square to see each square number (taken squares have a blue border) and if anyone wants a square, just let myself or Brian Caffrey know (bcaffrey@birdwatchireland.ie) quoting the number. All details and the online survey form can be viewed on the BWI website. It’s easy to follow: On the homepage, select “Our work” then “Research & Surveys” then click on “Swift Conservation Project”. This brings up the Swift page and at the bottom left there are links for the survey. We still have 3 – 4 weeks, but then it will be all over till next year. Thanks for your help." Brendan Black is conducting a survey of the Raptors in Fingal, primarily Buzzard, Kestrel, Peregrine and Red Kite over the next few years. He is interested in any roving sightings of the above between now and the end of August. Sightings can be sent to Bpblack@Eircom.net indicating where you have seen it (map is divided into 5km x 5km squares) and if any particular behaviour is observed, i.e hunting, displaying, etc. Nest sites should not be approached or disclosed. The Irish Grey Partridge Trust, Fingal County Council and the NARGC are working together to re-establish the Grey Partridge as a breeding bird in North County Dublin. This bird became extinct in Fingal about 50 years ago as a result of the intensification in farming practices and shooting pressure. A Grey Partridge reintroduction program was set up in 2011 in three farms in North County Dublin with the aim of establishing a new viable population outside the only other site in Ireland in Boora Bog in County Offaly. The conservation program has thought us many practical lessons and has also resulted in 11 confirmed breeding Grey Partridge pairs in the wild this spring. The reintroduction program is to run until 2016, but only if €900,- can be found to support this years project and this is where we need your help. The costs of the project for the 2014 breeding season is €47,000. The Fingal LEADER partnership and Fingal County Council will provide the most of the costs, but due to new LEADER funding rules the Grey Partridge Trust has to provide a contribution of €900, towards this project by the 20th June 2014. The funding will go towards the creation of new habitat strips, predator management, a community breeding program and a bird, bat and insect study. To make up the community contribution, we are looking for 36 people that are willing sponsor a Partridge chick for €25,- (or more if you can). get a guided tour to the partridge conservation project there. Details on how to sponsor a chick are indicated below. Should you have any queries regarding the above, please contact me on 087 1214641 or 01 8905605. For those wishing to donate by cheque or bank draft please make it payable to Irish Grey Partridge Conservation Trust and send it to John Walsh, Cromwells Town, Kilteel, Naas, Co. Kildare. Please do not send us cash in the post! The Irish Grey Partridge Conservation Trust was established to promote the conservation of Ireland’s native game birds. Ireland’s two native game birds, grey partridge and red grouse are now classified as red listed birds of conservation concern. One of the Trust’s objectives is reverse the decline of our native game birds applying a mixture of science and action. Over the past decade we have been instrumental in the recovery of Irelands naturally occurring grey partridge. A member of Drogheda Photographic Club had all his photographic gear below stolen from his car at entrance to Bettystown beach on Tuesday 1st April 2014 at about 12 mid-day. Door lock busted open and a sum of money also taken. If you hear of any of this gear coming for sale etc. please contact the Drogheda Photographic Club - Drogheda.Photo.Club@gmail.com. Serial numbers and the list of gear below. Broadmeadows 20th January 2014 @ 3.00pm: a birdwatcher fought off someone who tried to rob his camera. He was grabbed from behind and knocked to the ground. The Gardai have been informed. Please warn others about this incident. We previously alerted you to robbery of valuables from cars on the North Bull Island, however, one of our branch members had his camera equipment wrenched from his hands while he sat in his car taking photos of birds. A car with four men drove past their victim and targeted him. One of the passengers made the assault and left the scene at speed. Apparently, this is not an isolated incident. On the 9th November 2013 another branch member's car was broken into on the causeway. We would ask you to please be vigilant at all times. If you notice any suspicious behaviour please report same to the local Garda station. Throughout our cities and suburbs, Swifts have suffered a serious decline in recent years. One of the key causes of decline has been the lack of suitable nest sites, brought about by the destruction or renovation of buildings which used to provide the holes and crevices they need to nest in. Swifts are very traditional in choice of site and while nest boxes can be provided, they need to be positioned correctly and ideally have Swift call playback systems installed to lure birds in. It is often easier to build on existing nesting colonies than start new ones. The first step in taking action to reverse the downward trend is to find out where our Swifts are now, how many there are and where exactly they are nesting. So, with only a few weeks left before they head back to Africa, we are asking you to help by taking part in a simple survey. Any information you can provide on the attached recording form would be of enormous use – it will help us know where to focus efforts next year. In due course, we will be able to give advice on how and where nest boxes can be fixed, but in the meantime we need to gather as much information as possible. Thank you for your help. Click here for the leaflet associated with the photographic exhibition and the joint BirdLife International and BirdWatch Ireland Policy Briefing. 5 January 2013 UPDATE - some news about the Dipper nest from our April '12 trip to Slieve Bloom. "I just happened upon the Tolka Branch trip report to the Slieve Blooms last year. Interesting to read, and great to see these up on the website. The reason for this short message is in relation to the Dipper nest at Monicknew. I have to confess that I shared similar pessimism about the fate of the nest when I found it. However, despite all the odds, the nest successfully fledged three young at the end of May. What is perhaps more surprising, is that this nest also successfully fledged a brood of three in 2011 as well! It is a very unusual site for a Dipper nest, as the entrance is not over water but a concrete path (the only Dipper nest that doesn't have the entrance over water in our Slieve Bloom study area, where we monitor c.40 nests annually! ), as well as what must be very high disturbance during the nesting season for the pair. Clearly, anyone that makes the effort to go out for a walk at Monicknew has enough appreciation for wildlife to leave the nest alone - a very encouraging sign. I'm sure all those that attended the trip will be happy to hear that of the nest's success - and please feel free to pass the message on to anyone on the visit. Let's hope the Monicknew Dippers keep going and are successful again in 2013! " The National Biodiversity Data Centre is pleased to announce the launch of its new On-line Record Submission Form www.records.biodiversityireland.ie/ which it hopes will encourage the submission of casual records by members of the public. There are two options for recording species observations within certain taxanomic groups. Observations can be recorded via a ‘Species Form’ or via a ‘Site Based Form’. The form will also provide stats on the number of records received by group, county and day. Records submitted by you can be downloaded to an Excel sheet. Further information is available under ‘Frequently Asked Questions’ www.records.biodiversityireland.ie/faq.php and feedback can be directed to info@biodiversityireland.ie. It is easy to become blasé about this bird as it seems to turn up every year and shows so well but this is truly a rare bird. 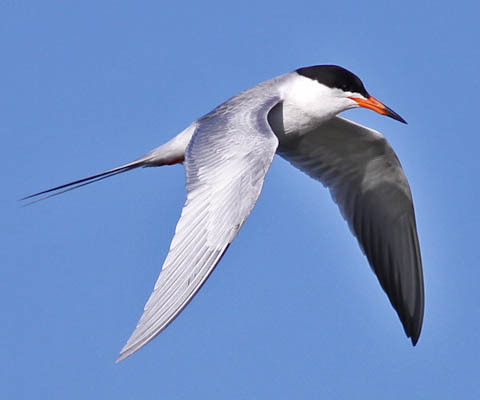 It's a North American species and to the casual observer it looks similar to our own Common Tern. On average we get only one of these birds each year in the Western Palearctic, however once a bird makes the mistake of crossing the Atlantic it often spends the rest of its life moving around on this side and so a lot of these records may refer to the same birds. It seems to be accepted that the Tacumshin bird is the same bird that has wintered in Galway Bay for the past few years. Another regular spot for Forster's Tern is Louth and this might also refer to the same bird. bill colour as Common with maybe a bit more black and slightly stouter. Chances are this bird will be around Tacumshin for the rest of the summer, so if you do get the time it's well worth a look. They are long lived birds but who knows how long this one will be around and how long will it be before you get the chance to see another one of these beautiful American vagrants? Dr José Alves (J.Alves@uea.ac.uk) has asked me to see if you can help him discover how bad the breeding season has been for the godwits in Iceland. Here is the email he sent and any help would be much appreciated. Thank you so much for contributing with your observations of colour-ringed godwits to the studies being developed in this consortium of godwit lovers. We now come to you in a quest to further understand this fascinating migratory system. Our most recent studies in Iceland, show that the past breeding season was very poor with many pairs unable to fledge a single chick. This has become a rare event during the past two decades! May temperatures were unusually low and the cold spell lasted until the second week of June, with morning frosts occurring throughout. Evidence for delayed and deferred breeding was apparent at our study sites in the southern lowlands (the warmest sites of the breeding range), and productivity has been perceived as low throughout the country. In order to record the consequence of such cold summers on breeding productivity we have recorded the proportion of juveniles found in flocks departing from Iceland. However, these juveniles still have to survive their first southwards migration. We would therefore also like to record the proportion of juveniles in godwit flocks throughout the range at the start of the non-breeding season. With this in mind we have decided to launch an appeal to all godwit observers and ask them to record the number of juveniles and adults present at their local godwit sites. This requires no more than a count of the flock size and within that, counting the number of juvenile godwits present (along with date, time and site as usual). If indeed we are able to have a good record of productivity throughout the godwit range we are likely to repeat a similar large scale recording of productivity on a “good year”, hopefully in 2012! We welcome your questions and hope you accept this challenge! 89,225 birds slaughtered…so far! – Sign the petition to stop it now! BirdLife Cyprus has just published online (www.birdlifecyprus.org) an estimated death toll from the illegal bird trapping taking place in Cyprus during this autumn migration season. The toll has been estimated on the basis of field data from BirdLife’s ongoing field monitoring of trapping activity with mist nets and limesticks, part of a systematic surveillance programme. This first estimate -89,225 birds- represents the number of birds killed between Thursday 1st September and Sunday 11th September 2011. The estimate will be updated every Monday until the end of October. BirdLife Cyprus is posting this death toll on its website to highlight the urgency of the situation and as a call for action to halt this slaughter! “We estimate that, so far this autumn, some 89,000 birds have been killed illegally using mist nets and limesticks in Cyprus. We know that the autumn season is the main trapping period and this number is certain to get much bigger over the next 2 months, unless decisive action is taken now to back up enforcement efforts”, said Martin Hellicar, Campaigns Manager of BirdLife Cyprus. In July, the ‘European Conference on Illegal Killing of Birds’ that took place in Larnaca, concluded with a clear ‘zero tolerance’ message and an urgent call for appropriate measures to stop the bird slaughter. BirdLife Cyprus is now calling for words to be turned into action by all competent authorities at all levels. BirdLife Cyprus is once again calling for decisive action against the restaurants serving the trapped birds, for targeted enforcement against big, organised trapping operations and for tougher sentences for convicted trappers. In autumn 2010 BirdLife Cyprus estimated that 1.4 million birds were killed by trappers in the Famagusta and Larnaca Districts, an unprecedented death toll resulting in the highest trapping levels recorded since 2002, when BirdLife Cyprus begun its systematic monitoring of trapping activity. “Such levels of trapping constitute an ecological disaster. Non-selective trapping is taking place on a large scale to feed the demand for banned ambelopoulia delicacies. We want to communicate the scale of this slaughter to the generally indifferent public in order to make them more aware of the issue and its ecological impact”, Hellicar added. The details of the death toll estimation and the methodology can be found on BirdLife Cyprus’ website, together with information on why bird trapping with mist nets and limesticks is such a big ecological issue. TO SIGN THE PETITION PLEASE CLICK HERE! June 2011 Bird News Service...New! People can sign up to twitter or text "FOLLOW ECoastBirdNews" to 51210, and follow the twitter feed to receive FREE texts of news of rare and scarce birds coming out of those counties. So, if you have any news of rare and scarce birds then just text the information to Mark. If you don't have Mark's number just email him at Mark Carmody <dr.carmo@gmail.com> giving your full name and your number and he will set up a contact for you. IWM is intended as a reference tool not a comprehensive guide to wildlife rehabilitation. Anyone undertaking wildlife rehabilitation must seek professional guidance as soon as possible. Helpful advice from An Garda Siochana, Crime Prevention Unit, in response to our warning note of two reports of binoculars and camera equipment having been stolen from cars on the North Bull Island. "It is never advisable to keep valuables in cars in the first place but people have a habit of placing property in the boot of a car when they arrive at the destination before going for a walk/birdwatching etc. This is a sure sign to the opportunist thief of something worth stealing. Classic example would be a woman putting her handbag in the boot and walking off. The thief, if he is around, will see this and know there is a bag in the boot of that car. If you need to put property in the boot, do so before you arrive at your destination so you are not observed putting it in. Never leave property on view in your car when un-attended. Do not leave a coat on the seat either, because it may look as if you are trying to cover up property on the seat - (even if there isn't any). Your window may just get smashed or your door damaged. Sat Navs are popular to steal. Wipe the ring that the sucker leaves on the inside of your windscreen so the thief doesn't see the obvious sign of a sat nav in a car." 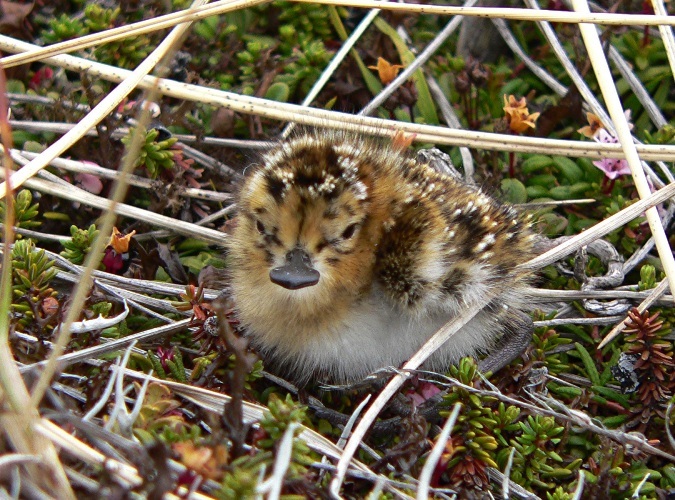 The Critically Endangered Spoon-billed Sandpiper may be down to as few as 400 birds. I’m delighted to announce that BirdLife’s work to save two key resting and feeding sites in China, used by one of the world’s oddest and most appealing waterbirds is to receive support from Disney’s Friends for Change initiative. The project, ’Saving Spoony’s Chinese Wetlands’ will receive at least $25,000. But if children around the world decide to give it their vote, that support could rise to $50,000, or even $100,000. We’ve just published a story on our website asking people to “vote for Spoony” on Disney’s Friends for Change website, and I’m writing to ask if you could also help us to promote the story and the need to vote. Chris Honan would be grateful if birders would look out for gulls wearing blue rings. Great Black-backed, Lesser Black-backed and Herring Gulls were ringed on Ireland’s Eye during the summer months of 2009 and 2010 as part of a continuing study. 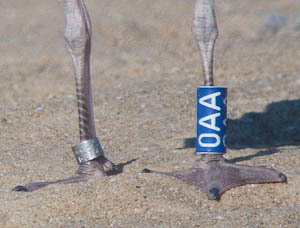 The birds have blue rings with white codes on their left legs and BTO metal rings on the right. Reports can be sent directly to gulls@eircom.net. Recent sightings include a Lesser Black-backed Gull in Cadiz, Spain that was ringed on Ireland’s Eye in 2009 and regular reports from Howth (up to 10 birds in two hours), Bullock Harbour and other locations along the Dublin coast.